A Whole Rest in 3/2 Time can equal 3 beats of silence. It can also equal 2 beats of silence. Why? Because the Whole Rest in 3/2 Time has 2 functions. A Whole Rest in 3/2 Time can equal 2 beats of silence, but only when it is used for the first two beats in the measure. This concept is introduced in the Basic Rudiments Workbook. A Whole Rest in 3/2 Time can equal 3 beats of silence. In 3/2 time, we have 3 half note beats. Let's have some fun and look at the above example. In Measure #2, the Whole Rest equals 2 beats of silence as it is the only rest we can use for the Strong plus weak pulses of beats 1 and 2. In Measure #4, the Whole Rest equals 3 beats of silence, as it is the Whole Measure of Silence (joining all 3 beats, Strong + weak + weak, into one rest). Let's see how y'all are doing understanding this whole rest in 3/2 time concept (which can be tricky...which is why I'm blogging on it!). 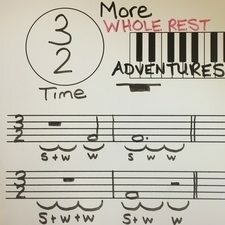 Silly Side Note - A student was questioning the concept of the Breve Rest the other day, so I pulled up my blog - Whole Rest in 4/2 Time - and read it with her. As I "proudly" showed her some of my other blogs, she started to laugh and said that it must be my mission in life to educate teachers on all those theory concepts that students ask questions about. I thought for about half a second and said "Yup! I guess it is!". Whole Rest in 3/2 Time with an Anacrusis. So - back to the Whole Rest in 3/2 Time! Looking at the example below, can you tell me: Are both Whole Rests equal to the same number of beats of silence? The answer is no, each Whole Rest in the example above has a different function and receives a different number of beats of silence. As my student would say - "Prove it"! In order to look at the number of beats that each whole rest in 3/2 time receives, we must first add the Measure Numbers. Did you spot the anacrusis? upbeat; specifically: one or more notes or tones preceding the first downbeat of a musical phrase. When dealing with an anacrusis (a pick-up beat or incomplete measure), we do not count the first incomplete measure as being Measure #1. Why? Because it isn't a complete measure. The final measure and the measure at the beginning of the music equal one complete measure. Therefore, the FIRST measure is the FIRST measure that you count with a ONE. Thus we have 4 measures in our example. To continue to prove that each Whole Rest in 3/2 Time has a different value, add the Scoops, Counts and the Basic Beats. Measure #4 is incomplete - it only receives 2 beats (2 half note beats) of silence as the 3rd beat (the 3rd half note beat) is found at the beginning of the example in the anacrusis. The final proof that each Whole Rest in 3/2 Time has a different value, add the Pulses. Remember that a Strong beat can join a weak beat into one rest; however a weak beat can never be joined with another weak beat into one rest. Here's another "Shelagh Saying" - "TWO is TOO weak TO hold on TO three, you must use TWO separate rests". And guess what - it is true! 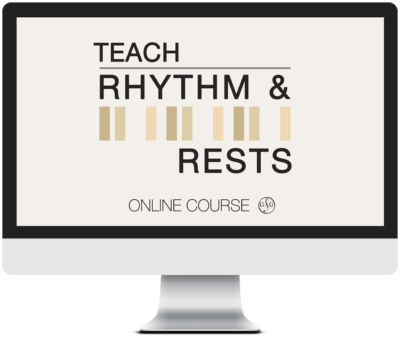 If this concept is new to you, please do not hesitate to explore our Ultimate Music Theory Teach Rhythm and Rest Course! When you understand the concepts of Scoops, Pulses, Basic Beats and Counting, you will be able to teach these concepts with confidence. And, you will be able to answer those "why" questions that your students will ask. Shelagh, you are brilliant! Thanks for the fun and the very clear instructions. Bravo to you!!! Yes Melrose, you are right, Shelagh is brilliant! P.S. Hope to see you at the Calgary Workshop tomorrow May 22!